Shoveling snow – especially the heavy, wet stuff we just got – can tweak our backs, make our arms sore and get the heart rate up. To relieve some of that tightness, try this gentle restorative sequence. Make your movements slow and deliberative, following your breath and taking as long as you need to in each pose. From tabletop, step back into Downward Facing Dog, pedaling your feet to loosen the leg muscles. Extend your arms out at shoulder heighth, bring the right arm under the left and cross your arms, bringing your palms together if you can. If not, you can keep the backs of your hands touching and hook a finger or two. Another option is to place your hands on your opposite shoulders. Once you have your hands placed, lift the elbows, broadening the upper back. If your hands are on your shoulders, push your elbows forward. Take several breaths, then release the hands and arms. Repeat, this time bringing the left arm under the right. Legs up the wall (Viparita Karani) – rest in this pose for at least five minutes, to release tension in low back while stretching tight hamstrings. With kids, work, school and all the other obligations we have in our lives, most of us don’t have big blocks of time to devote to a long practice. 1. Focus on your breath. First, notice it without making any changes. Is it hard, shallow, sticking in any spot? Then begin a slow inhalation and exhalation, making them of equal count. If you’re feeling anxious or stressed, lengthen your exhale. Depressed or need more energy? Lengthen your inhale. 2. Bring yourself to the present. For the next few minutes, be aware of what you’re doing. For instance, instead of going on autopilot to wash the dishes, consciously feel the soapy water, the dish in your hand, the movement of your arms and hands as you scrub the pot. 3. Do a few poses. No need to do a complete practice, just get your body moving with some cat/cow, sun salutations or down dog-to-plank vinyasas. It will wake you up mentally and physically. 4. Read inspirational material. 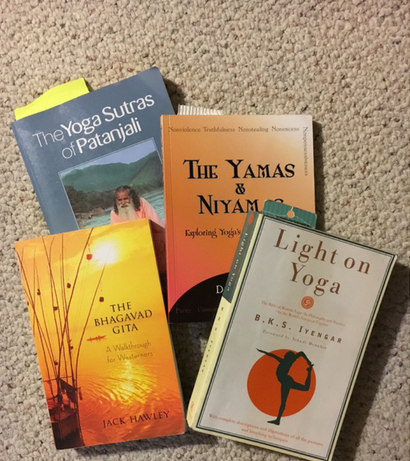 Read two or three yoga sutras (The Yoga Sūtras of Patañjali is one text), a paragraph from the Bhagavad Gita or any book that speaks to you. 5. Write in your journal about your practice. What has changed for you – mentally, physically, emotionally, spiritually – since you started your yoga journey?